This week was awesome. I was finally able to get back on track with exercising after 3 days off because I was sick. I exercised 5 days, increasing my jogging every day except Friday - I kept it light because I pulled a muscle in my foot on Thursday and I didn't want to overdo it. I also had some very delicious food (of course it helped that I could actually taste it). My breakfast is fairly predictable. I usually have Oatmeal (occasionally Cream of Wheat) with fruit (although lately I've been making Pumpkin Pie Oatmeal), cottage cheese, or hard boiled egg whites if I'm skipping the cottage cheese, red bell pepper, and a cup of unsweetened almond milk (and lots of water). (Dinner) Leftovers - it was just too yummy I was happy to eat it again! (Dinner) Leftovers - I almost couldn't wait until dinner because it came out so good! I've made sushi before - but yesterday it was so much better! I kept it simple - California rolls for the kids, spicy tuna and salmon rolls for the hubster and I (with a little tuna and salmon sashimi on the side for all of us). Making my own sushi is the best way to really control the calories involved! Most sushi rice is made with seasoned rice vinegar which has tons of sugar... if they happen to use plain rice vinegar then they add sugar - which drastically raises the calories. For the crab mixture I only used 1 T. mayo and 1 T. Greek yogurt - and added a little dill (we love dill). For the spicy tuna I used 1 tsp. sesame oil and 1 tsp. mayo and a generous 1/2 tsp. sriracha- it tasted amazing without all the extra fat. I felt like I splurged by eating two rolls and some sashimi - but when I calculated the points it wasn't bad at all (I was able to eat 2 rolls for the same points as 1 take-out roll)! Next time I get a craving for sushi - I will most definitely be making it myself. 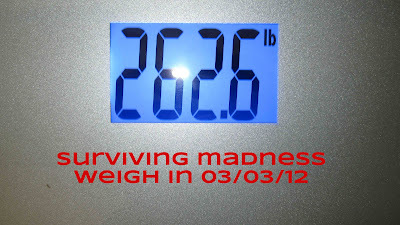 Ok, enough about food and on to my weigh in. I wasn't sure I wanted to weigh in this week - I knew I ate well and exercised a lot... but I had a feeling the scale wasn't going to budge much, if at all. Anyone who has a lot to lose always wants to see 2+ pound losses each week. But there will be many times when you lose on a portion of a pound (or worse, a gain)... I'm thankful to have lost an entire pound! It's been exactly 1 month since I started and I've lost 13.4 pounds! Instead of concentrating on the weekly loss, I'm going to focus on the bigger picture - how much I've lost altogether. 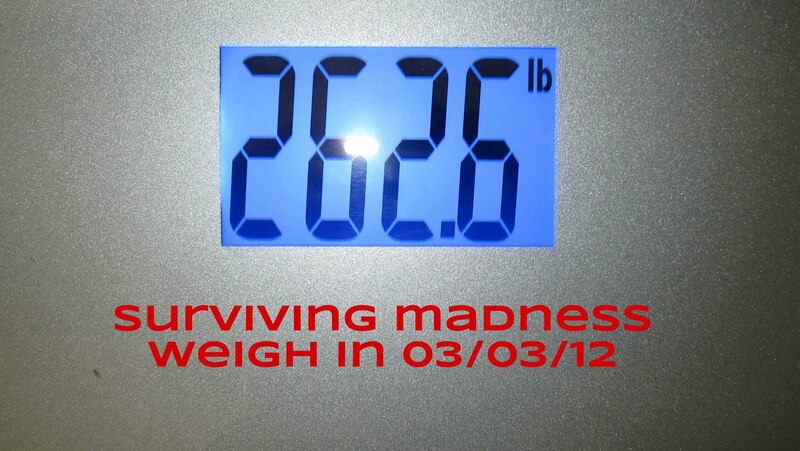 It's much more exciting to know I lost 13.4 pounds than a mere 1 pound this week. Thank you to everyone who is rooting for me and encouraging me - it really means the world to me! YEA! Serena! you are doing soooo great! Just make sure you are geting enough of those fat-soluble vitamins (eat the egg yolks!). MashaAllah I'm so proud of you! Jazak'Allahu khair! Eggs are actually very healthy and good for weight loss. I don't usually eat the yolk because I actually prefer the tates of the whites more - but I'm also trying to cut the calories (not the fat). I definitely know how important healthy fats are! I might experiment next week with increasing the fat intake a little and see if I don't notice a difference... Now that I reevaluate everything I've probably been a little low on my fat intake. I'm happy knowing I'm doing the right thing - eating good, healthy foods in appropriate proportions and exercising my little heart out at least 5 days a week! I feel amazing too - I used to only want to stay home and I slept nearly 12+ hours a day (with an afternoon nap) but I still felt tired all the time. Now I wake up at 5am and I'm awake until around 9:30/10pm with no naps and plenty of energy to make it the entire day. I look forward to taking the kids on their bike ride while I walk/jog - and I don't feel like such a hermit!